I’ve held off of my rant against the god-awful pre-budget report and decided to focus on shiny things instead. Like my new Guitar Hero World Tour drum kit! Coming in a box large enough to house a full family of wombats, it surely is a thing of plastic beauty. First thing to report is that the Guitar Hero World Tour drum kit is a marked improvement on the original Rock Band equivalent. The RB kit, although a fresh idea at the time, always felt a little flat and awkward with its four pads. My main issue being the spacing and that when I was staring fixedly at the note stream if my hands wavered it wasn’t always easy to differentiate between the middle pair. GHWT has solved this by stripping down the basic drums to three and adding a pair of raised symbols. It may not be much of a refinement but the definite placing of all five pads just lifts the whole experience for me – you know exactly where you need to bring the stick down, no matter where you are mid-flail. It feels more satisfying, too. The simple aesthetic addition of the symbols still can’t separate you away from the fact that you are playing an oversized Fisher Price toy but the actions played out on it are just far more satisfying. You know exactly when a symbol smash is coming and bashing those elevated quarter circles of black rubber feels amazing, far better than the flat equivalent in Rock Band. The moveable and more sturdy foot pedal is also a welcome upgrade as I no longer feel my foot is cramped underneath the tiny frame. And so to the Rock Band 2 v Guitar Hero World Tour software battle. In summary Rock Band 2 is by far the better game. It has oodles of downloadable tracks already, its difficulty curve is friendly to newcomers, it has a varied but lengthy career mode to plough through and it has the all important “no fail” mode for when you get a drunken band together. In contrast, Guitar Hero is much harder for novices, its career mode’s progression is extremely strict and DLC are currently scarce. What World Tour can offer, though, is drum arrangements that are more involving. 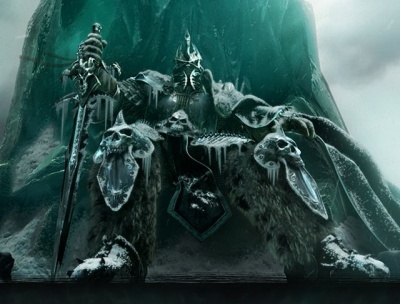 Throughout the game there is are strict definition of what pad means what. For instance, the left symbol is always high hat, the right being crash. Rock Band may do similar but not to the same level and it is the consistency in GHWT that makes it a better drumming experience. What makes the comparison fairer is that both games share a lot of songs and having played Bon Jovi’s Living on a Prayer and others on both, I much prefer the style in which World Tour lets me hit things with sticks. So it’s six of one, half a dozen of the other. I’d heartily recommend GHWT’s drum kit for all the little things like the spacing of the inputs, the foot pedal and the build quality as a whole, but I’ll be playing it on Rock Band 2. Now Ali’s taken up the bass I can’t see our band, The Secret Society of Buzzlegums, ever moving back to GHWT… although I may sneak over for the odd solo. 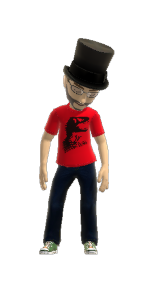 When Avatars were first announced I did think it was a slightly odd choice of name for Xbox’s Mii equivalent. You see, in the code that we use at work an “avatar” is simply an in-game object. Spades, fence pieces, tiles, houses, totem poles, garden furniture, eggs and most other simple items are all classed as avatars. Even the slightly more fanciful characters like Cooper and Leafos have avatars constructs hidden within them. I couldn’t help but think it was quite a cold name. Obviously, the rest of the world doesn’t have this hang up. Since they’re release this week these caricatured playthings spread across the Xbox community and are now grinning back to me in abundance from my friends list. Personally, and I’m not just saying this I promise, I like them. I have always felt, as amusing as they were initially, the Miis just were a little too bland. The concept was amazing but I didn’t quite feel as attached to my Mii as I probably should have been due to the abstraction. On the opposite end of the scale, the characters I’ve seen from Sony’s Home are too trendy. Every video of them has almost intimidated me into not wanting one of their’s. From a glance at their shots it seems that you have to live in an ultra trendy part of a fashion conscious town to be accepted in their beautiful people community. I could be completely wrong but I do not like the vibe that’s coming forth. And so we have Avatars. They’re not perfect but they’re a nice middle ground. Support for them is rising forth from several Arcade games but it will be the full retail games where they make their mark. Army of Two tries, bless it. It tries to expand EA’s license dominated catalogue and offer up a fresh experience. Drawing on principles usually seen in MMOs, this third-person shooter places players in the bodies of two meat-head jocks working for private military contractors. Sent around the world fighting for a paycheque, this pair need to work closely together to push through each exotic level. Against a stream of foes, the two must use cover and distraction to progress. When either shoots or advances they generate aggro. The more aggro generated, the more invisible your partner effectively becomes with the enemy forces preferring to focus on the biggest perceived threat. This is where it really does try something different. This very clear idea of where your enemy’s attention is focused allows for tactical movement through the battlefield. Good communication between partners can make short work of those in your way. Those, however, with no clear plan could find themselves bogged down in arduous firefights. Extending the teamwork principle, even if someone takes a tumble it’s not necessarily game over. Dragging them to a quiet corner allows for some emergency first aid. There is no limit on the amount of times this can be employed, the only deterrent is forcing the other into harm’s way. Whilst in principle the game’s ideas are sound, there a far too many niggling problems to see Army of Two live up to the initial promise. The main offender being the enemy AI which can flip suddenly from overly reclusive to suicidal lemming. The controls simply can’t cope with fast moving foes close up. The targeting is not responsive enough and all too regularly you’ll get clotheslined by an onrushing soldier which cannot be countered. The game does bring a handful of fresh ideas to the table, including coordinated sniping, a “back to back” mode which sees players at the centre of an on rushing horde and a parachuting section where one steers and one shoots, but none of these ideas truly raise the bar. 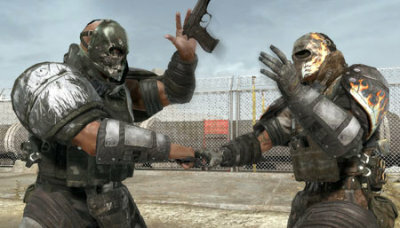 Army of Two can be put down as a commendable effort to buck the licensing trend but something that ultimately falls short of reinventing co-op play. One of the reasons why recently this “thing” isn’t updated nearly as much as it used to – I have twice tried to upload a Fallout 3 First Impressions – is because of some severe technical difficulties. I don’t know what’s going on or why my website hates me but 75% of the time I cannot access my blog. I can 100% access my test page and at the moment I can only dream of that reliability translating to my main offering. If anyone who can actually reach this page has any ideas as to why straight html webpage access is fine but WordPress/SQL lookups are iffy then I will gladly take any advice going. An exciting weekend as for once I got all dressed up for Halloween. No, not “some bod from Mortal Kombat” but the Cardboard Tube Samurai from Penny Arcade. What was most impressive about the costume for me was the fact that six hours before I went out I didn’t have any idea what I was doing. A quick and desperate trawl of the local charity shops managed to turn up a complete set of bright yellow sowesters. Thrown together with some black edging, a cardboard hat and some Pacman motifs, the CTS was born. Also out and about were the mummy, the witch, the dark jester and the headless horseman. The latter was particularly impressive and dedicated considering he could hardly see, drink or breathe easily with his costume on. So on Friday night, the five of us all turned up at The Old Contemptibles in Birmingham, ready and raring for a spooky party only to find that it was just us and the bar staff in costume. Everyone else was wearing suits having popped in after work for a cheeky pint. Considering there were signs all around the bar for a “Halloween Bash” we felt a little let down. Not to be beaten, a quick taxi ride later saw us rubbing shoulders with Dracula’s bride, a chap on the wrong end of a chainsaw attack and various other freaks. We were at home amongst them and merrily danced our way into the early morning. So, how did Halloween pan out for you?